Hotel Deals Ireland -here are a shortlist of 10 top picks in northern Ireland. 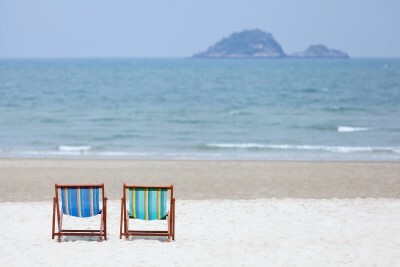 Looking for cheap hotels? 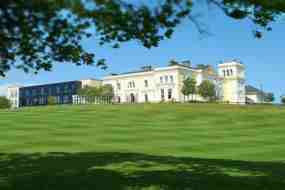 Ireland really does have an outstanding selection from 5 star Ireland hotels to discount hotels. Ireland has many types of accomodation from the low cost Premier Inn to the more homely selection of bed and breakfast in Ireland. These can be found by following the links. 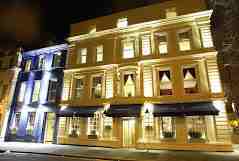 The hotels listed below are a selection of what is on offer in northern Ireland hotels. You can go to www.booking.com to check availability and discount on these hotels in Ireland. The warmth of the reception and attitude of the staff in this Beach Hotel, Downings will be amazing. Rooms are great, food excellent and the management will go out of their way to make you feel at home. We would highly recommend to anyone travelling to this beautiful part of the world. 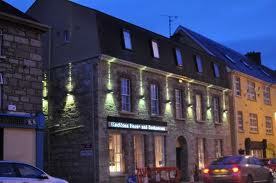 The Beach Hotel, Downings is situated in Downings Bay and is approximately 35 minutes from Letterkenny, 55 minutes from Derry-Londonderry and is the perfect location for all the near by attractions and activities including Glenveagh National Park, Atlantic Drive, Golfing, Angling, Surfing and many more! Located in the heart of the Fermanagh Lakelands, near Enniskillen on the shores of Lough Erne, Manor House Country Hotel is the perfect country retreat combining old world charm with modern hotel luxury and a warm Fermanagh welcome. The private grounds that surround the hotel are wonderful . Take a leisurely stroll in the open countryside. Enjoy complimentary access to the Leisure Centre complete with Swimming Pool, Outdoor Hot Tub, Steam rooms, Jacuzzi, Sauna & Fitness Suite. ‘Younique’ Beauty Salon, has a range of alternative health and beauty treatments featuring Repêchage, a nutrient-rich seaweed-based product range. Also unique to the Manor House Hotel is the Lady of the Lake Cruiser with the magnificent Lough Erne looking up. Harvey's Point is a beautiful inland location with very comfortable accomodation just outside County Donegal. Many times recently as a family we have dropped in there for Sunday lunch in particular as we live no more than 30 minutes drive. If you are staying over they can have angling Activities for you with the Lough Eske fisheries centre that will assist any visiting angler with permits, licences and further information all available at the centre. As well as the Eske fishery centre, Harvey's Point Hotel has a wide range of other Game Fishing and Sea Angling services available to it within the locality. The Harvey's Point Hotel location while being a sanctuary away from pains and strains of everyday life, it is still easy to access the spectacular coastlines of Donegal. 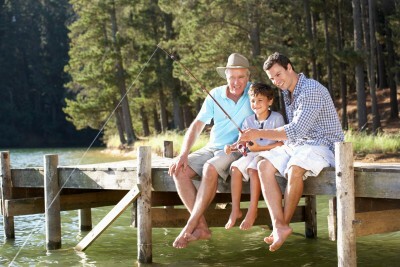 With the abundance of coastline and inland waterways, Donegal is the perfect destination for all types of angling. This is an excellent selection in Northern Ireland hotels choice for convenience and value as it is only a few minutes walk from the city centre and if you are going to Belfast on a budget. Elegant modern interiors behind a 19th century traditional facade. Georgian rooms with mahogany canopy beds, floral drapes in regal reds and greens, and antique furniture. Excellent food at the bar and restaurant. Great value for money. This is in the top band of 5 star hotels in Ireland and the elegant architecture and opulence of the Merchant Hotel, Belfast is very romantic and a great entry in any hotel planner. The Merchant Hotel, Belfast is characterized by dramatic Italianate architecture and an ornate, expansive style, with decorations in rich tapestries and luxurious fabrics. There are 38 new rooms, a new luxury spa for guests, a modern gymnasium and a new, authentic jazz bar with live jazz and food nightly. 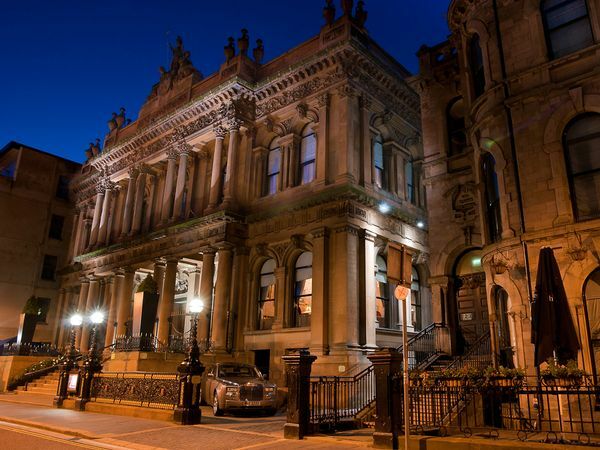 The Merchant Hotel, Belfast is located in the lovely Cathedral Quarter of Belfast, an area rich in culture and history, perfect for romantic walks. MacNean House & Restaurant, Blacklion, Co. Cavan. This place is truly, truly special-not really a hotel more a sumptuous cosy, lovely house it has 19 lovely rooms which is just right on the border between Fermanagh and Cavan. Treat yourself to a simply amazing dining experience-it is just unique with oustanding cooking. MacNean House is probably one of the best restaurants in Ireland with a lovely personal touch from Neven and his team. Just maybe when you ring MacNean House you will get a weekend cancellation as you are in the right place at the right time ! 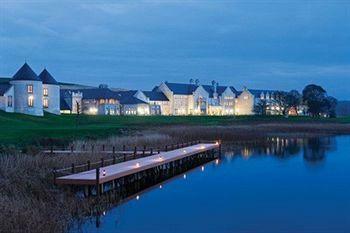 Lough Erne Golf Resort is new world luxury and another of the 5 star hotels in Northern Ireland hotels. It is set on its very own 600 acre peninsula, between Castle Hume Lough and Lower Lough Erne, just outside Enniskillen, with stunning panoramic views from almost every vantage point. You can walk around the shores of Lough Erne with all the stunning views, relax and chill .drop down to the Thai Spa or if you have the gold clubs dust them down and play the beautiful course-all great holes but I like the par 3 fifth over the water. After leaving its green though, take a deep breath before you climb to the sixth tee! The magnificent Slieve Donard Resort and Spa is nestled in the heart of County Down where the 'Mountains of Mourne sweep down to the sea’. Standing on 6 acres of private grounds, the hotel has been providing the best of Irish hospitality for over 100 years. The Percy French restaurant provides a cosy and friendly atmosphere in which to enjoy the talents of local live acts. The Slieve Donard Resort and Spa has all the facilities you need to relax and unwind from today's hectic pace. 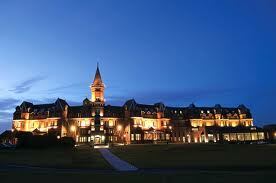 Stay at the Slieve Donard and you can pretty much step out of your comfy bed and onto Royal County Down golf course. It really is that easy. What’s a little trickier is the course itself. A favourite with golfers like Tiger Woods and Rory McIroy, this challenging links features in the Top World Courses list of every recognised golf critic and magazine. Bushmills Inn is a Luxury, Four Star Boutique Northern Ireland Hotel in the heart of Northern Ireland’s Causeway Coast. It is a renowned inn offering genuine Irish hospitality and scrumptious food in its award-winning restaurant. Classic-chic bedrooms in neutral tones with four poster beds. A warren of little snugs create a cosy ambiance. Bushmills Inn is a great choice for groups and families. Sights nearby include Royal Portrush Golf Club, Old Bushmills Distillery, The Giant’s Causeway, Carrick-a-reed Rope Bridge and Dunluce Castle. Lough Eske Castle is another of the five star castle hotels in Northern Ireland hotels located on a secluded lakeside estate just outside Donegal Town. It is an historic building set in a storybook location delivering superior hospitality and comfort and is the ideal place for those who simply want to relax and unwind. The Lough Eske Castle Hotel is outstanding in every detail .The drive up to the castle is amazing and when you first see the castle emerging through the trees, it's such a wonderful sight.The staff are amazing and their professionalism adds to the sense of luxury and relaxation. Lough Eske Castle is the only Irish hotel to claim a World Luxury Hotel Award and has won the World's Best Luxury Country Hotel title for the past FOUR consecutive years (2012, 2011, 2010, 2009). It has also been named No. 1 Hotel in Ireland by MyGuideIreland; voted Wedding Venue of the Year 2010 & 2011 and Castle Venue of the Year 2009/2012 and wedding coordinator of the year 2012 by Ireland's largest wedding website: Weddingsonline.ie. Lough Eske Castle has also been recognised among the World's Best Castle Hotels by global travel expert Stephanie Abrams and is the only five star hotel in County Donegal, Ireland. Go to www.booking.com for availability and discount on these hotels in Ireland.